Georgia county commissioner wins month's mortgage at annual meeting while Georgia United Credit Union wins some statewide business. 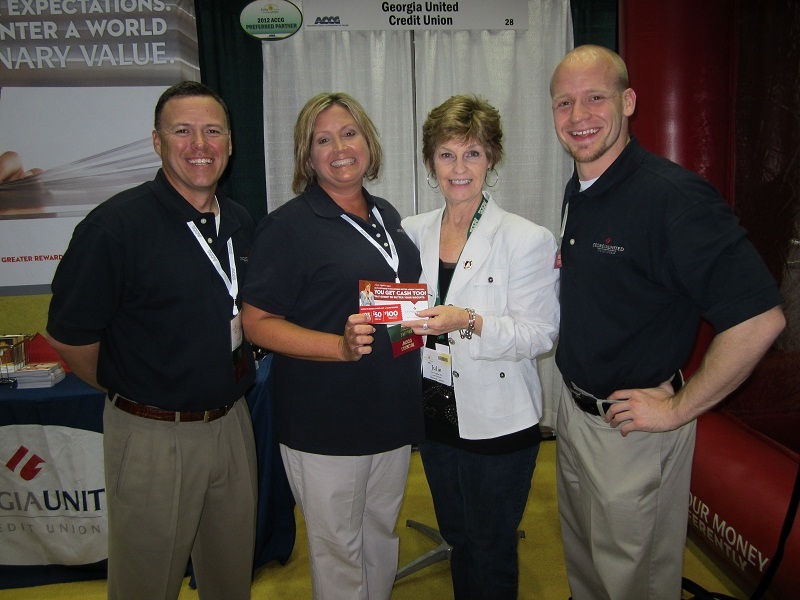 Georgia United CU representatives (in dark shirts) - John Burns, Amy Jones, and Logan Mason – present Dawson County Commissioner Julia Hughes Nix (in white jacket) with the grand prize of a month's mortgage payment at the Association of County Commissioners of Georgia annual meeting in Savannah the weekend of April 28-30. The $935 million Georgia United Credit Union paid a month’s mortgage for Dawson County Commissioner Julia Hughes Nix after she won the top prize in the “Cash Grab Machine” at the Georgia United booth at the recent Association County Commissioners of Georgia annual meeting in Savannah. Duluth-based Georgia United was an exhibitor at the event and also has become a preferred partner of the association, which allows county employees and commissioners across the state to join the credit union.